Our summer fun has just begun - keeping the kids busy! 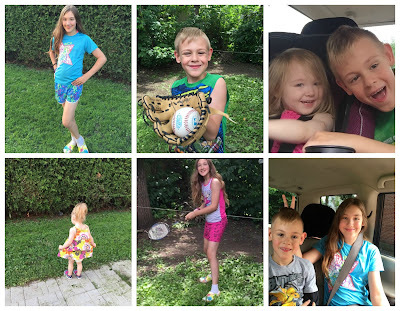 We are only a couple of weeks into summer vacation with the kids and already we have been keeping them busy or rather they have been keeping us busy. No matter what we seem to do or as much as we try to tire them out, these kids have energy to boot! Needless to say they are up and at 'em as early as they would be on a school day. Imagine, not taking advantage of the chance to sleep in?! These can't be my kids! I'm kidding. We spend a lot of time outside, the kids have almost everything they could need in the back yard plus the park and pool are a two minute walk away. We have been doing at least one fun thing every day besides playing in our own back yard like taking the three kids to the splash pad and pool. We also have gone a few times to see the RCMP horses and the planes over near the Canadian Aviation and Space Museum. There are a lot of things to do in Ottawa if you check around and plan accordingly. I don't mind being spontaneous in the summer months but when it comes to activities that will keep the family happy, I enjoy a good plan. This week we will be adding on a bigger day trip we have all been excited for at Calypso water park. It has been years since either hubby or I have been to a water park and the kids have never been. I have checked out videos and such so I kind of know what to expect. It's always more surreal when you are actually there though. It should be quite the day to remember, check back here for a post about our adventure! We have a big event planned almost every week this month, the kids have been excited since before school ended and we can't wait to spend a great summer together. The moments don't last forever and they go by quickly, now is the time to take advantage. Enjoy those moments and have fun! I will be updating as I go or as I can, like I said time is limited during these summer months but you can always check in with me via social media too! Summer Family fun at #CalypsoPark! Mattel Games™ – Make Time To Reconnect! Ever After High™ – Choosing Your Destiny! A new way to buy and sell local with Varage Sale! Win with Hallmark - A Summer Giveaway!